Union Rags (foaled March 3, 2009 in Kentucky) is an American Thoroughbred race horse and winner of the 2012 Belmont Stakes. Trained by Michael Matz, Union Rags was one of the leading American two-year-olds of 2011 whose wins included the Champagne Stakes and the Saratoga Special Stakes. Despite a defeat in the Breeders' Cup Juvenile he was one of the early favorites for the 2012 Kentucky Derby, but finished seventh, following a poor start. Skipping the Preakness Stakes, he won the Belmont by a neck over the Bob Baffert-trained colt Paynter. Union Rags was retired from racing in July 2012 after a tendon injury. He entered stud for the 2013 breeding season and his first crop reached racing age in 2016. 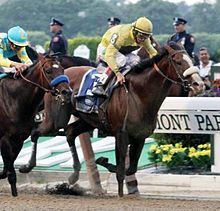 Union Rags (right) winning 2012 Belmont Stakes over Paynter. Union Rags is a bay with a white blaze sired by Dixie Union who won the Haskell Invitational Handicap in 2000 before becoming a successful stallion. His dam, Tempo, was a granddaughter of the 1000 Guineas winner Glad Rags. Union Rags was bred by Phyllis Mills Wyeth, 71 (in 2012), whose parents Alice du Pont and James Mills were prominent owners and breeders of Thoroughbreds. Wyeth, who is married to artist Jamie Wyeth, was a steeplechase rider when young, but at age 20 suffered a broken neck and spinal cord damage in an automobile accident. Initially able to walk with braces, she has used a motorized chair for many years. Wyeth initially sold Union Rags as a yearling, on the advice of tax accountants, but repurchased the horse the next year. She races Union Rags under her nom de course, Chadds Ford Stable. Union Rags made his debut on 12 July when he won a Maiden race at Delaware Park Racetrack. In August, he was moved into Grade II company for the Saratoga Special Stakes and won in "impressive" style by more than seven lengths. On October 8, Union Rags stepped up to Grade I class for the Champagne Stakes at Belmont Park and started the 6/5 favorite against seven opponents. Despite struggling to obtain a clear run on the final turn, he broke clear in the straight to win by more than five lengths from Alpha. Union Rags started favorite for the Breeders' Cup Juvenile at Churchill Downs on November 5. He moved up to challenge the leader Hansen in the straight but "veered" from a straight course before staying on strongly in the closing stages and finishing second by a head. In the voting for the title of American Champion Two-Year-Old Colt, Union Rags finished second to Hansen. In his three-year-old debut, Union Rags won the Fountain of Youth Stakes at Gulfstream Park "comfortably" by four lengths from News Pending, with the favored Discreet Dancer two and a quarter lengths further back in third. At the same course five weeks later, Union Rags started the odds-on favorite for the Florida Derby but finished third behind Take Charge Indy. In the Kentucky Derby, he started second favorite at odds of 5.1/1. Following a poor start, and at one point last in the field, he finished seventh of the twenty runners, seven and a half lengths behind I'll Have Another. Union Rags did not run in the 2012 Preakness Stakes but was entered in the Belmont Stakes on June 9. Following the withdrawal of I'll Have Another, Union Rags started second favorite for the race behind Dullahan. John Velasquez settled the colt in fourth place on the rail as Paynter set the pace. In the straight, Union Rags made steady progress on the inside to overtake Paynter in the final strides and won by a neck. After the race, Matz said, "We always thought this horse had Triple Crown potential." Union Rags was being prepared for a run in the Haskell Invitational when he sustained a tendon injury in his left front leg which ruled him out for the rest of the season. A week later it was announced that Union Rags would not race again and would be retired to stud. Union Rags entered stud at Lane's End Farm for the 2013 breeding season for a fee of $35,000. His first reported foal, a bay colt out of the Dehere mare Gleaming, was born on January 19, 2014. The colt, now named Confederate Rags, is a winner. On April 20, 2016, Union Rags had his first winner in Lady Stardust at Aqueduct in a maiden special weight race going 4 1/2 furlongs. On September 3, 2016 the filly Union Strike became his first Grade I winner when she won the Del Mar Debutante Stakes. Union Rags finished second in the 2016 earnings list of first-crop sires based in North America. ^ "Sports Illustrated - May 3, 2012". Sportsillustrated.cnn.com. 2012-05-03. Retrieved 2012-05-21. ^ "Dixie Union Stud Record". Bloodstock.racingpost.com. 2012-02-15. Retrieved 2012-06-09. ^ "Union Rags profile". BloodHorse.com. Retrieved 2012-05-21. ^ Tim Layden (May 4, 2012). "The story behind Union Rags and two people's shot at Derby glory". Sports Illustrated. ^ "Saratoga Special Stakes". Racing Post. Retrieved 2012-05-21. ^ "Champagne Stakes". Racing Post. Retrieved 2012-05-21. ^ "Breeders' Cup Juvenile". Racing Post. Retrieved 2012-05-21. ^ "Welcome to the Thoroughbred Racing". Tra-online.com. Archived from the original on 2012-05-25. Retrieved 2012-05-21. ^ "Fountain of Youth Stakes". Racing Post. Retrieved 2012-05-21. ^ "Kentucky Derby". Racing Post. Retrieved 2012-05-21. ^ "Union Rags wins the Belmont Stakes". USA Today. 2011-11-28. Retrieved 2012-06-09. ^ Associated Press (July 22, 2012). "Belmont winner Union Rags retires". Wall Street Journal. Retrieved 2012-07-22. ^ "Smart Strike's Fee Remains at $85,000 in 2013". bloodhorse.com. Retrieved 4 September 2016. ^ "Union Rags' First Foal Is a Colt". bloodhorse.com. Retrieved 4 September 2016. ^ Balan, Jeremy. "Lady Stardust First Winner for Union Rags in Debut". bloodhorse.com. Retrieved 4 September 2016. ^ Mitchell, Eric. "Union Strike Rolls Home in Debutante". bloodhorse.com. Retrieved 4 September 2016. ^ "Dialed In Holds Off Union Rags in Freshman Sire Race". BloodHorse.com. Retrieved 8 January 2017. ^ "Union Rags on Stallion Register Online". Stallion Register Online. Retrieved 2017-09-13.